I have been making a lot of soups lately with almost any ingredient that I can find, that needs to be used up. Soup for dinner is so comforting and makes for a perfect meal especially when you are alone at home and are in no mood to cook. It also fits in with my plan towards healthier eating in spite of the numerous failed attempts. Here’s a recipe for a soup that only takes minutes to make and calls for just a handful of ingredients. The recipe involves cooking some onions, potatoes and cauliflower florets till tender and then blending everything together to get a rich and creamy soup. Heat some olive oil in a large saucepan and add the chopped onion, ginger & garlic. Sauté everything for a minute or two. Add the potato cubes and cauliflower florets along with a little bit of water and cover & cook till tender. Blend/Puree the mixture after cooling and return to the saucepan. Add the nutmeg powder, season with some salt and pepper, garnish with some herbs and serve hot. This looks delicious. Though I have never tried cauliflower soup. Maybe we can substitute brocolli in this soup. Have you already tried this? Thanks for sharing. mmmmm! Nice cauliflower soup! Never could have come up with that one. This looks really yummy and relatively health with the use of milk instead of cream. I guess the season is soon going to be upon us when all that warms the heart is a delicious hot bowl of soup. hello there...tq 4 dropping by at my blog..urs is nice too..i'm always xcited when it comes to food's blog..hehehe...i hope u dont mind if i link urs? tq in advance..
Looks so creamy,yummy and heavenly. The picture looks awesome. My hubby is a big fan of soups. Will surely try it for him. TBC, what a great idea using cauliflower. Now that winter is round the corner, I know where to get awesome soup receipes. What lovely photos! They are making me very hungry! I love the addition of ginger in your cauliflower soup to give it that little twist. Good looking soup! Since the climate is changing here too, I should also start making soups. I just finished my dinner, and now i see this! I have some serious craving now :-D. Very inviting bowl of soup! Hi ther, so let me the first one to comment on your soup..even thou i don't prefer soups mcuh,yours does looks really inviting!! !..i am very new to the world of blogging, to be precise, just 3 days old..but, a silent reader of many of the beautiful creations on cookery blogs for months!! !..all this , and a push from Viji of Vcuisine(whom i happened to meet while i was wandering amongst these blogs) led me too, to start one of my own. one thing in common with both of us is, ur initial posts just shows the images...not the writeup's..and same is mine!! Soup looks delicious and yummy. I too love soup it is so comforting. thanks for ther tecipe. i tried cauliflower soup once and hated it, but your pic is tempting me to try it again. Hey...the soup look so rich and creamy even without cream!! Soup picture is very tempting! but I like cauliflower as it is and not in soup! but the colour tempts me to try!May be I will! it sure does look like an easy soup recipe:)looks awsome:)wil try this one.hope i can use fresh cauliflower instead of frozen! Soup looks yummy !! Your pictures rock. I love soups. Nice picture. Thanks for adding the recipes. I would love the hummus recipe. 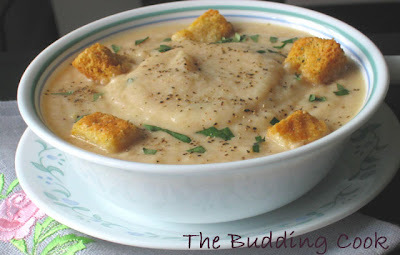 this cauliflower soup looks so amazing and yummy.. will try it soon..
Lovely picture and the recipe! Tee, let me know how you like it. Savithri, Jenndz, Nirmala, Cynthia, Kribha- thanks for the kind words and the compliments. Pragyan-You most certainly can & I have a recipe for broccoli soup posted too , if you are interested. Rachana- do try it out. Zlamushka, I just checked out your soup & I'm gonna make it when I buy Zucchini. Archana-Tell me how irt turns out. Sia, It really tastes good & you could modify it to suit your tastes. The nutmeg gave it a nice flavor. EMWK, thanks. I was alone & hungry & didn't want anything too elaborate. Shn, thank you for stopping by & thank you for your kind words. Yeah, I hate those soups which have dollops of cream & other fattening things. Pooja, thank you. It means a lot tome 'cos I takealot of time to take the pics. Helene, welcome to my space & thank you! I promise I will update my older posts(including the hummus post)when I get a chance/ make it again. Siri, thanks for visitng!& thank you for the compliment. 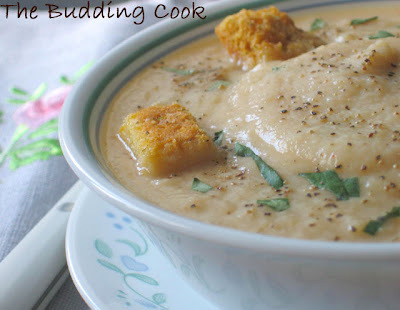 Never tried cauliflower soup....looks pretty tempting TBC, Also loved ur pineapple halwa..will try it out soon. This dish looks really delicious, I have made this type of soup before and I think mine were dull, but you added a few spices that really bring up the flavor, love that! Namratha, do let me know how you like it. I too think the nutmeg is the star here. Kajal, you are welcome. Hope your mom is better now. lovely thick soup,will make this tody! Hi TBC, delicious looking soup. Would love to try this recipe out. Is there a substitute for nutmeg powder? Lets see how it goes. Your soup looks perfect. Nice idea of having it during night. And yes, a pinch of nutmeg does make a difference. Thankyou so much for sharing and inspring me to try this recipe out. Will be posting it in my blog soon. Grihini, thanks a whole bunch for letting me know. Carrots will make it nice & sweet & a little more creamier too, not to mention the lovely color. I tried to check out your blog too but I guess you have not enabled your profile? this looks excellent.. so delicious.. nice pic too.